At the Fence: SC Gift Baskets Giveaway! "For years now we have enjoyed making and sharing items that we both made and also from working with Non-Profit Organizations. Fundraisers are one of the most rewarding to us, Gift Baskets were the big item to do and we enjoyed it greatly. With that we decided to sell Gift Baskets + More in our storefront and make your online shopping experience a safe and secure one, which is number #1 goal! We hope that you will also enjoy our Products. Because of shipments going over the Border we have had to add a Canadian order's Only as well as for the USA. These are well listed in the contents of the product and you can move though all products with ease. Thank you, come again. On occasion, it may be necessary to substitute products, but with saying that we will substitute a product or item of equal value or higher." just watch they may want you to share these treats. Ideal for any occasion such as Birthdays, Just Because, Thank you and more." of Fun dip and 2 boxes of assorted nerds arranged in a multi colored gift box." The Simply Dazzling Gift Tower! This Gift Tower looks and sounds really good. Included are : Sander's chocolates, caramel popcorn, buttery peanut crunch, mixed nuts and gourmet flavored almonds carefully arranged inside. This looks like a great gift tower that anybody would love. I know I would! I like their Autumn Leaves basket. I would like the velert plaid christmas! Lori, the first day you had this post up I did this but it didn't act like it worked. I checked today and saw it didn't take, so I will try again. Another gift I really like and my husband would love is Fesival of Favorites. I would love to have the Two Dozen Fresh Baked Cookies basket. I like the Jeepers Creepers box. The Snuggle By Cookie Bouquet looks good! Great gift baskets! I would LOVE The Candy Syndrome basket...I am a candy FREAK! The Mug Hugs Christmas Delight looks cute! The Happy Halloween looks amazing! i like the sugar free basket!!! Would love the Chocolate & Nuts Gift Chest. I like the Candy Syndrome Gift Set. I like the Mug Hugs basket. The Holiday Fruit Tower would be great to try. The coffee-tea and cookie basket looks soooo good! I'd love the mint Delight Fudge Tin. I would love the Traditional White Wine and Gourmet Basket! I'd love the Sports Go Team Go Basket! I like the Student Survival Gift Basket. I like the Sugar Free Treat Basket. I would love to win this! I like the harvest medley gift basket! Thanks so much for the fantastic giveaway! I love the Happy Halloween gift basket! I'd love the Blooms for Gardening basket, my grandma would love it! I like the Harvest Medley Gift Basket. Can I cheat and say I like them all?? The Jeepers Creepers is pretty cool!! I also like the Christmas Surprise basket! Just like Mom's cookies looks good. I would like their Happy Haunting gift basket. I like the Frosty the Snowman gift basket. I like the Christmas Surprise. I like the Jeepers Creepers Halloween Basket-so cute! I like the Two Dozen Fresh Baked Cookies Just like Mom's cookies basket. I like the Heart on my Sleeve Cookie Bouquet. i would get the plaid Christmas boxes! I like the Festival of favorites basket! Lots of good stuff in it! I really like the Java Time Gift Box. I also like the Coffee, Tea and Cookies Gift Basket. I would like the macadams' chocolate collection. I like the candied christmas one. I would enjoy the Chocolate Sweet Sensations gift basket. However, their website SORELY needs a makeover so I would not likely buy any of their products. The Here Comes Santa gift basket would be a cute gift for a variety of people. I like the winter sleigh ride basket. I like frosty the snowman gift basket. i like the macadams chocolate collection :) yummy! The Wine Aficionado Gift Basket looks fabulous. I like the Deluxe Tailor-Made Tower. I would love the Mint delight Fudge! The Distinguished Gourmet Gift Basket looks absolutely fabulous! I would love to try the candy syndrome. Frosty is oh so cute! I would love their Frosty the Snowman tower. I love the Velvet Plaid Christmas tower. I would like to win the "Simply Dazzling Gift Tower" to give to my best friend at Christmas! The Here Comes Santa gift is cute! I would love the Christmas Star Bright! I'd pick the festival of favs. gift basket. I like the Chocolate Delight Gift set. 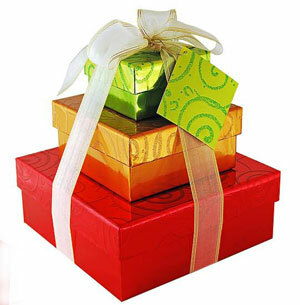 THE DAZZLING GIFT TOWER LOOKS SO PRETTY, I WOULD PICK IT. The candy syndrome gift set looks great!! I would like the Frosty the Snowman, it is adorable. Frosty the Snowman looks cute. The Velvet Plaid Christmas looks so festive. I would love the Let It Snow gift basket. I really like the Festival of Favorites! I like the Christmas Surprise Basket! LOVE the Christmas Dog Tin...too cute!